I am sure many of you have heard of Edyta Sitar and her amazing designs for “Laundry Basket Quilts”. 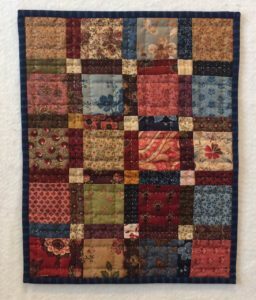 Recently I purchased her book called Little Handfuls of Scraps and I have been making little quilts from her patterns. I love them! I just had to share a picture of all of them together (and I have only scratched the surface – there are 32 patterns in all). Although it was the most difficult (because of set in Y seams) I believe I like the center one the best. It is called “Anna” – she has named all the quilts after women’s names. Here is a picture of “Anna” (17.25” x 17.5”) by itself. Don’t you just love the way the center star seems to vibrate with all the colors circling around each other? Edyta has great directions in her book for putting this together, and it doesn’t even involve paper piecing. But I must say that my set in Y seams improved greatly after making this quilt. I might even have to add this picture to my Facebook page. 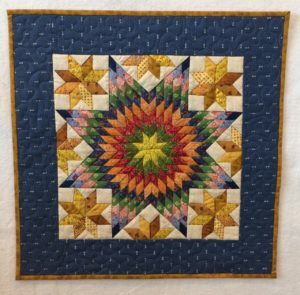 I just recently joined Facebook and I am enjoying all the quilting pictures and ideas that get shared. 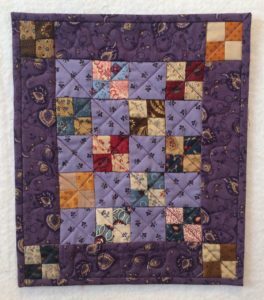 Of course, I love that she also has some simpler quilts like this four patch (9” x 10.75”) which I set in purple. It went together very quickly, and I appreciate the sweet look it creates. Another easy to make quilt is “Sophie” which uses a little 2.5” charm pack. You don’t even have to cut up a bunch of fabrics – just purchase a charm pack and use the already coordinated fabrics with darks and lights. My last one is a quilt I made four years ago and called it “Tea at the Corner Table” but in her book she has one called “Alysha” which is very similar. 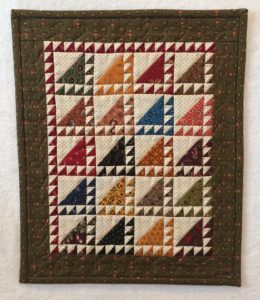 I love little HST – Half Square Triangles and this quilt sure makes good use of a lot of them. Vicki and I were talking yesterday, and we are inspired to start a Laundry Basket Doll/Small Quilt Club where we could get together once a month and create a little quilt. Be watching the next Newsletter for more information and dates on when we will begin! I want to take a moment and say thank you for so many kind emails and cards that you have sent my way about my mom’s passing. You have touched my heart and I Really appreciate it.